Bulletstorm is a new original intellectual property from the teams behind the award-winning, multiple million-selling Gears of War, Unreal Tournament and Painkiller series of games. Bulletstorm brings new furor to first-person shooter action with its signature ‘kill with skill’ gameplay, which is packed with blockbuster moments. 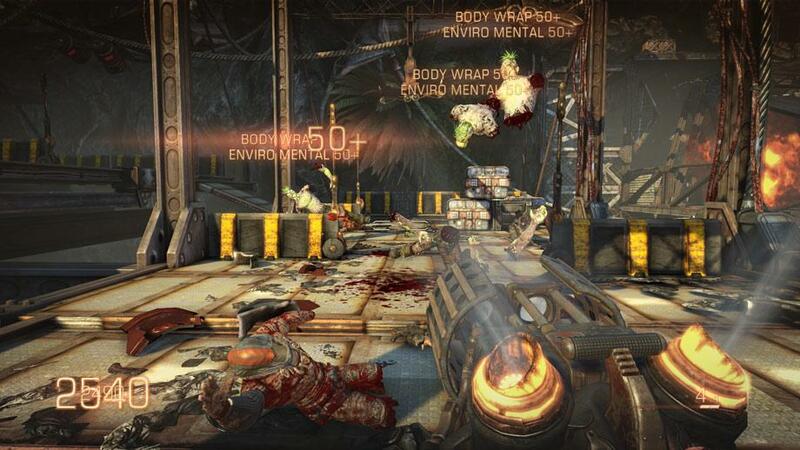 Bulletstorm tells the story of a futuristic confederation protected by an elite band of mercenaries: Dead Echo. When Dead Echo members Grayson Hunt and Ishi Sato learn they’ve been working for the wrong side, they’re betrayed by their commander and exiled to the far reaches of the galaxy. In Bulletstorm, Grayson and Ishi find themselves surrounded by hordes of mutants and flesh eating gangs in an abandoned paradise. They have two objectives: get off the planet alive, and exact revenge on the man who sent them there. Players step into the role of Grayson Hunt complete with an arsenal of over-the-top combat moves and outrageously large guns. Bulletstorm’s array of distinct ‘skillshots’ produces unprecedented levels of frantic gameplay and yell-inducing satisfaction. The skillshot system rewards players for inciting mayhem in the most creative way possible. The more insane the skillshot, the more points players collects to upgrade their character and unlock weapons, which then allows them to execute even more creative moves and exaggerated skillshots.